Two simple programs make it easy to schedule your PC's bed time. I prefer to shut down my PC at the end of the day. There I said it. I know that puts me into one of two camps in the world of PC users. So be it. The trouble is that I often forget to turn off my PC after work. Since I work at home I get distracted by dinner, the kids, a visitor...whatever. A handy way to make sure your PC shuts down at a preferred time is to automate the process with a simple program. 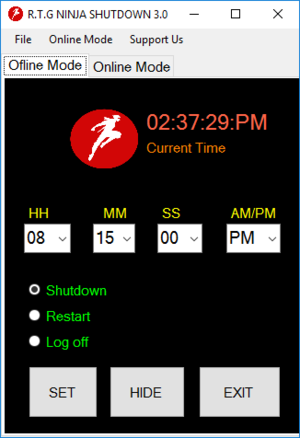 There are many apps that can do this, but two programs in particular make the job especially easy: RTG Ninja Shutdown and Simple Shutdown Timer. RTG Ninja Shutdown is a single window, portable app created by India-based developer Priyanshu Kumar. After you download it as a ZIP file from Kumar’s website, extract the folder and keep it somewhere handy, like your Documents folder. Whenever you need to use it, just double-click the EXE file and the program appears. Everything is pretty self-explanatory. You want to be on the Offline Mode tab. Then choose the hour, minute, second, and AM/PM option that you want. A key thing to remember here is that RTG Ninja won’t work if you don’t fill out all four fields. So make sure you set your seconds option even if you’re only setting it to zero. Then choose the radio button for the option you want, which can be to Shutdown, Restart, or Log off. Now click Set and you’re done. If you don’t want to keep the window open click Hide to keep it out of the way (or to surprise your kids if you’re limiting computer time). RTG Ninja also has an “online mode” that allows you to set a shutdown time remotely, but I didn’t explore that option as it requires interfacing with the developer’s server. Personally, I’d rather just keep it local. 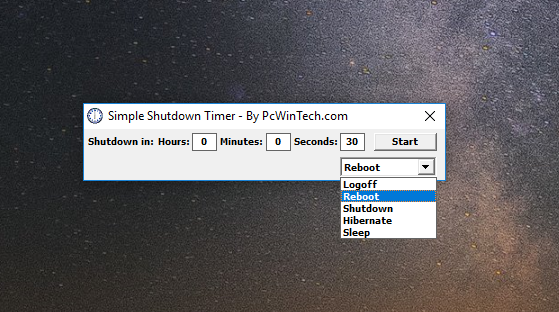 Believe it or not, you can get even simpler than RTG Ninja Shutdown with PCWinTech’s Simple Shutdown Timer. As you can see in the image to the left, this program is ridiculously small. It would be nice if it had an option to expand the window, but it doesn’t. With this app all you have to do is set how long you want your computer to run, filling out the hours, minutes, and seconds text entry boxes. Then click the drop-down menu and decide whether you want the PC to log off your account, reboot, shutdown, hibernate, or sleep. Then just click Start, the timer begins counting down. Simple Shutdown Timer is a traditional installed desktop program that works with Windows 2000 and up, and there’s a portable version available as well. If you’re into the command line, Simple Shutdown Timer also works with a few commands, which you can read about on the company’s website. If these two programs don’t catch your fancy there are tons more such as Windows Reboot and Switch Off. If you’re really daring, you could also learn to schedule regular shutdown times via Windows’ built-in Task Scheduler.